Alex speaks with economist, film-maker, and television show host Max Keiser about the impending fiscal cliff and the continued slow-motion implosion of world markets. Alex Jones..... Talks To Max Keiser: 2013, Year of The Great Crash. 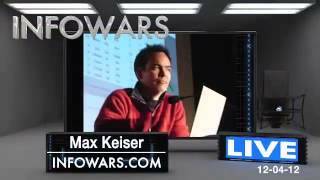 Added: January 6, 2013 ... Max Keiser Asks Alex Jones When Americans Will Revolt. ALEX JONES & Max Keiser 2013, Year of The GREAT CRASH! [INFOWARS Nightly News] Alex speaks with economist, ... ALEX JONES & Max Keiser 2013, Year of The GREAT CRASH! [INFOWARS], THE ALEX JONES SHOW | Max Keiser: World Gov't and World Tax is Here (10/1/2012), ALEX JONES & Max Keiser 2013, Year of The GREAT CRASH! Max Keiser: We're in A Financial Holocaust!